Want to learn some useful French expressions, words and slang that you probably don’t cover in French class? We compiled a list of colloquial (everyday) terms you’ll hear in France. You can sprinkle them into your conversations to sound more fluent or smile to yourself when you hear your French friends use these words. Since this article is extremely popular there will be a followup post with an additional 25 words. So here’s the first 25 French expressions and slang words you don’t learn in French class (unless your French teacher is awesome). Recently I was surprised when my cousin kept saying this term and I had no clue what it meant. Ever since he explained it I heard it being used by my relatives, my friends in the South and even the teachers I worked with. Faire gaffe is just another way to say « faire attention » or pay attention, watch out, be careful. Make sure you conjugate the verb faire when necessary. These two words are extremely useful. En fait (pronounced: ohn-fet) can either connect two phrases, or be used as an interjection. Franchement accentuates speech and bring attention to an opinion. Ça y est (pronounced: sigh-ay) is a little French expression that has two main meanings. It’s usually a replacement of the word “finally” in French, « c’est fait / enfin ». However it’s also an expression that can be used when you find something you were looking for. Oh man, two of my favorites words right here (not sure what that says about me). These words describe one thing: different states of being drunk. Pompette is the equivalent of being tipsy in English; when you drank enough to feel it but not enough to regret anything. Déchiré is on the other end of the spectrum and it mean’s you’re WASTED… you’re hammered. Game over – déchiré. Get ready for that walk of shame tomorrow morning. These two words are colloquial ways of saying the verb « travailler », or “to work”. If you want the noun le travail can be replaced by the word le boulot. Let’s go OR let’s get started! You enthusiastically yell « c‘est parti ! » before starting a task or going somewhere with someone. Nickel is French slang for the word “perfect”. When something is A-OK you can confirm it by uttering this easy French word. These are more informal ways of saying “to eat” (manger) or “food” (la nourriture). This is an informal variant of “oh my god”. It’s when an unbelievable event contains compassion, surprise, and a myriad of other intense emotions. Your friend just fell down the stairs and before helping him up you scream this phrase. Then you stare in horror. Then you both laugh because he’s alright. Phew, la vache. 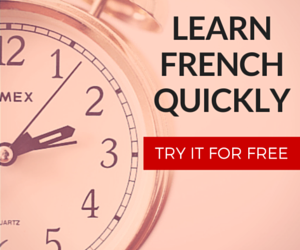 This is an easy way to up sounding fluent in French. Native French speakers don’t fill the silence in their speech with “um’s” and “uhhhh’s”, but rather with « euhhhh’s » and « bah’s »! These three words all are small interjections that should be incorporated into your French speech. Bof signifies indifference, mild disappointment, or boredom in something. In English, bof is essentially the word “meh”. Euh is the English equlavent of “um” or “uh”, it’s used to buy yourself time when trying to find your words while speaking. Bah is another filler word, yet more often than not you’ll find it at the start of a sentence. Mais attention ! When you respond with the statement, « bah oui » to one of your friend’s questions, this indicates that he or she made an extremely obvious statement. The question was so evident that it didn’t even warrant a response. 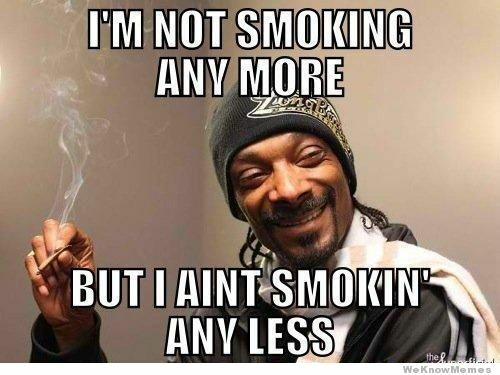 I can guarantee your high school French teacher won’t let you in on these words, but they’re Snoop Dogg approved. Cannabis, Mary Jane, weed, however you want to call it, the French language also has many different terms for marijuana. Even though I’ve never smoked I decided it’s worthwhile to share these words because you hear them if/when people colloquially speak of marijuana. I heard these words quite often on the streets. Used in many parts of France and is generally understood to mean “dude” and “chick”. Sympa is an abbreviation of the adjective « sympathique », and here I talk about how you can use this word and many others to sound more Parisian. It’s the perfect word. I could write a whole article on this word, there’s even a TV show titled « Bref ». However me being long winded about a word which means “brief” or “in short” would be kind of ironic. Bref is used when you want to make a long story short, instead of explaining every intricate detail of something, you simply utter the word bref and then get to the point. During a toast rather than saying “cheers!” we say « Santé » in French. It’s a way to wish well upon each other’s health. Make sure when you’re toasting that you look the other person in the eyes otherwise you’ll be called out on being rude! This is how the typical Marseillais expresses « oh mon dieu ». You’ll encounter this word during a football (soccer) match when those poor OM supporters get scored on in the 90th minute. If this article helped you then share it! Follow FrenchCrazy via Facebook or our newsletter (see the sidebar) to never miss another update. Want to learn more types of French slang? Check out this post on French Slang (Verlan) as well as this one on French Texting Slang/Abbreviations. Well there you have it, 25 French expressions and slang words you don’t learn in French class. Hello! Thanks for this list of words. I want to know the French equivalent for ‘man/dude’. As in , ‘sorry man/ hey dude’. Do they use desolé mec or any other word? My father-in-law used to have an expression in reference to a home that wasn’t kept up by those who lived there. It sounded like “chez de boo”. I would like to know its real meaning and also how to spell it correctly. In my first semester of college French, I was very much impressed by the supposed existence of a French word that meant “…go together well.” Now, after the passage of many years, I found myself wanting to use the word. I thought that it was something like “chebui “, but I can’t find it anywhere. Can anyone out there help me? Let´s say that some of them are tipical Parisian French expressions. Anyway it is very helpfull. I often see the phrase “coucou” as in “coucou, les filles” . I understand that it is mostly likely slang and is probably a greeting. I was just wondering if you knew what was the “real meaning” of this is and if you had any idea from where or when it started. Your help is greatly appreciated. Coucou means Hello but you have to use it only with friends. It comes from kids, who say “coucou” when unhiding. So “coucou” to adults is a gentle way to say “here I am”. It can be aggressive, depending on the tone or if you don’t speak to close friends, with the meaning “here I am… and you don’t listen”. I believe you’re more likely to hear “defoncé” than “déchiré” to say wasted. It’s been a while since I last heard the latter. What is the translation in english? Top can mean cute or nice and people say tooop more o for the more cute or nice. if someone need some translation or abbreviations contact me, I will can help you. Can someone tell me what PLS means? PLS= Position laterale de sécurité= recovery position. Young people say that when they’re seek, in troubles, it’s like you’re KO. Bref, I didn’t even realise sympa was slang. Thought it was standard French. Also, regarding tu et vous, I call everyone who calls me vous, vous and everyone who calls me tu, tu. There is no way I’m letting someone talk ‘down’ to me – as also goes for a lot of my work colleagues. Hey Chris, thanks for you comment! I agree with you on the tu & vous aspect. If someone wishes to guard their distance or remain polite then our conversations shall remain formal. If you want to get to know me on a personal level then changing that subject pronoun is one way to get started. When I worked in France I used tu with almost all my co-workers despite them being maybe 20-30 years older than me. They were awfully friendly and we met up a lot outside of work. These are fun. Thanks for sharing them. I wanted “you drank” thanks. We also use “la Caisse” (litteraly “the Box”) as a slang synonym for “la Bagnole”. There will certainly be room for 25 more words. Great post! Probably worth pointing out that pompette tends to be only used when talking about women. Great post. I know and use many of these but there are several new ones that I will start to sprinkle into my conversation. Trop stylé!! J’adore la France. Pas mal pour un petit aperçu des beautés de notre langue. Congratulations and keep going! Merci. Very helpful words. As someone who is not yet fluent (even though I somehow managed to earn a B.A. in French years ago,) I seldom get to speak with anyone with whom I’d feel comfortable enough using these expressions. In fact, on the language exchange site where I write to pen-pals, I’ve been reprimanded for using ‘tu’ numerous times. The problem is that so many contemporary French learning texts insist on teaching informal French. So much so that I forget the formal usage. I assume those books assume that one is practicing with young fellow students who would not use vous. Anyway, enjoyed your post. But how do you know I forgot anything? Check out the next few slang articles Charlotte! I have seen an expression on Facebook “tu dates” that translates to “you date” even if I reversed that it doesn’t make English sense…in the context that I see it anyway…any idea what it really means slang-wise? Verb “Dater” in French means being from specific time in the past, consequently, not being up to date. “Tu dates” (to a person) : your knowledge is out of date.